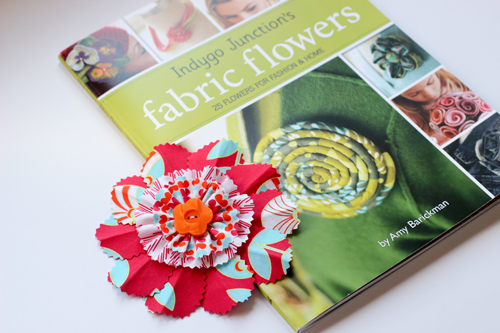 In Color Order: Indygo Junction's Fabric Flowers Review + Giveaway! 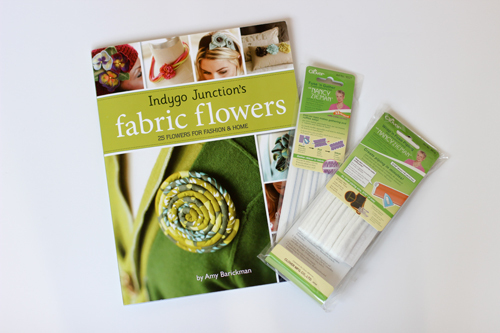 Indygo Junction's Fabric Flowers Review + Giveaway! Today I have a fun new book to share with you and a giveaway to boot! Welcome to my stop on the blog tour for Indygo Junction's Fabric Flowers by Amy Barickman! You'll find 25 different fabric flowers in this book, made with a variety of techniques. These flowers are perfect for embellishing your outfits, bags, gifts, home--the possibilities are endless! For my flower, I choose to use the red prints from my line with Art Gallery Fabrics, Color Me Retro! I made the Pinked Posy! I added an extra gathered layer so that I could incorporate all three prints! I found the sweet orange button to match at my local Jo-Ann. I think I'll use my flower to embellish a tote bag or perhaps display on my inspiration board! I had a lot of fun making this flower pin! The instructions were easy to follow and it was good to get myself out of my comfort zone and use fabric in a different way than I'm used to. I definitely need to do more crafts like these. I have my eye on a few other flowers in the book! You can get a better view of all the flowers in this video! There really is a little bit of everything in this book! 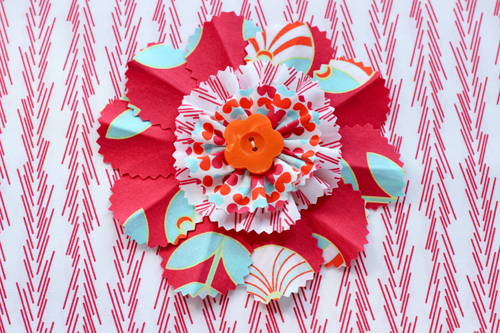 Who knew there were so many different ways to make fabric flowers? I'd love to try some of the flowers that use wool! Now how about a giveaway? Many of the projects use handy Clover notions and tools! 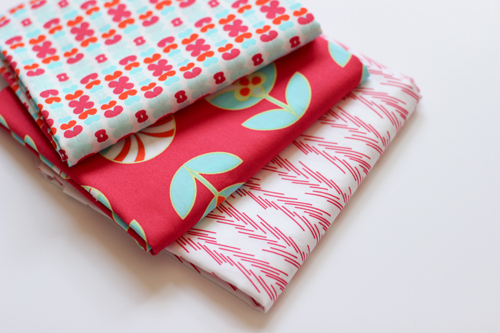 So, along with a copy of Fabric Flowers, the winner will receive Clover Fuse 'N Gather and Clover Wrap 'N Fuse Piping! I'm excited to try these products out myself! To enter, simply leave a comment! Giveaway will be open until Friday, March 8th at 5pm CST. One entry per person, all entries welcome. And a little treat for everyone! Use code FFBK22 - for 20% off your IndygoJunction.com order (offer expires 5/1/13)! Ohh I love making fabric flowers. I'm going to have to check this book out. 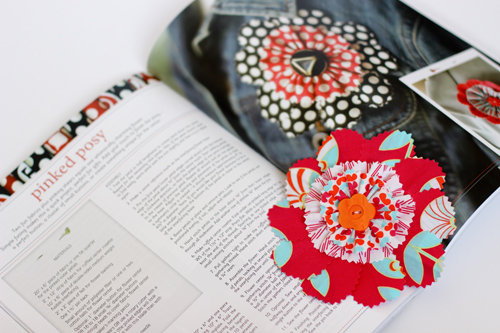 I looooooove fabric flowers - have made a couple from tutorials on the net....I would so love to win this book. Even my 15 year old daughter has got me to make her a couple to jazz up her clothing.....now thats pretty cool ;-) Thank you so much for the giveaway Jeni. Think of the beautiful garden you could make! Good luck to all! Such creativity! It looks like a great book. Thanks for the chance to win it. What fun! I love the fabric flowers. They would be great as embellishments on crazy quilts or little girl clothing. What cute flowers! And I love how yours turned out! Beautiful! That looks wonderful book! I have made some flowers from fabric and felt but would really need new ideas! Thank you for sharing! We have a wedding coming up in our family this year - I think it would be fun to make the flowers. Thanks for the chance! Very interesting. That is a really nice give away. Thanks for a chance to win. that's a pretty book love to win it thank's for the chance to! have a beautiful day like your flower! The flower you made turned out so cute - especially in your new fabrics!! Thanks for the chance to win. Now that would so fun to make! thank you for the chance. Thanks for the chance to win the book! I have many things I can embellish with fabric flowers! That looks like a great book! Thanks for the giveaway! I'm always trying to learn something new. This would be quite exciting to try. Your flower is amazing, I love your fabric collection. Thanks for the chance! I would love to win this book for my daughter! I think it would be perfect to get her into sewing. 2 years old is old enough to start right?! lol Thanks for the chance! I would love to have this book to play with! How lovely...the flowers are so pretty. Thanks for a chance to win. Oh my goodness - the rose bouquet is beautiful! Fabric flowers are so cute! Looks like a handy book to look up. Pretty flower - this looks a great book, I would love to win a copy! What a gorgeous book! Love your flower, especially. Thank you for sharing your findings with everyone ... pretty much work with fabric flowers, recycle very, very difficult to buy fabrics I usually use leftover seamstresses, companies cut clothes ... and I love it all too. love your blog, thanks for everything! The flower looks great in your new fabric! It's nice that you can change up the patterns for more creative options. Thanks for the chance! Think spring...and flowers! Nice giveaway! Thnx. I love your cheerful flower and the fabrics you used! My daughter would love some fabric flowers! Lovin' the unique and different Spring posies! Ohh! I'd love to win. I think fabric flowers are SOOOO beautiful! Lots of fun ideas here to embellish my sewing projects. Thanks. I think some fabric flowers could dress-up my scrubs for work. Thanks for the give away! Such a cute little flower! I think fabric flowers are the best! Really lovely flower with your fabric and I love all things Clover! With 4 grand daughters to sew for, this would make a great addition to my pattern arsenal! Thanks for a chance to win. What a great giveaway! Clover tools are so handy, I use their bias tape makers all the time! How fun, I love the idea of making these as embellishments. The book looks great, so does your flower! I love your fabric choices! A perfect flower to embellish almost anything! My girls have started experimenting making their own fabric flowers for their head bands, etc. This would be so timely! I have many bags I want to make. The flowers will look great on them. Would love to have this book... There are so many things I want to do with the flowers. Thanks for the chance to win. Hi!!! I love the flowers!!! Thanks for the fun give away!!! Love that flower arrangement! Thanks for an awesome giveaway! Love the flower thanks for chance to win. Oh wow... I would have so much fun with this!! Thanks for the chance to win! Thanks for the opportunity - cute flower! My granddaughter would love me to make these fabric flowers to wear in her hair! Would love to win this book. What a lovely book, looks like a lot of fun! Hope I win. Great looking flowers, I will have to try this out. Very cool!! I love your version! What lovely flowers....these would be perfect to make for my daughter. I have this book and I can't wait to start playing!! I NEED this book! Cute, cute!!! So cute! And I love your fabric line. This is a cool giveaway! Please pick me! Thanks for te chance! What a great looking book! I can't wait to see it. I can see many possibilities with this. Thanks. Adorable flower! Thanks for the chance to win! I love making flowers!! Those products are very intriguing; I have not seen anything like them before and seem like they would be great fun to try! Looks like a great book! I would love to make some cute flowers. Thanks for the chance to win. These look like fun! Thanks for the chance to win. Love your flower and it looks like a really fun book! Com a primavera a caminho...Flores e livros seria o sol a iluminar os meus dias.Sua flor é linda e o livro eu quero na minha mesa de trabalho. Love the flowers! I'm planning a wedding for my daughter and these would be fun to incorporate. Fabulous flower!! What a fun giveaway!!!! Great book! Your flower looks FAB! Love your flower, can not wait to read the book. I just started out making fabric flowers, and would love to get my hands on this book to learn more techniques on making different flowers! what a great book and giveaway! What a lovely posy flower! Thanks for the chanceto win! I really love the look of this book, the flowers are gorgeous! Thanks for a chance to win! I've been looking for just such a book to craft flowers for my wedding! I love your flower! It's so fun :) This looks like a great book. Thanks for the giveaway! Great little flower. Saw you as the Aurifil designer of the month. I'm making a little wall (door) hanging with 3 dimensional flowers so this book is perfect. This looks like a great book. I am a librarian and ordered a copy for my library, but it would be wonderful to have my own copy. I can't wait to make flowers! I love the three prints you used! I really want this book! This book looks like one I really need to have, so many pretty flowers. Thank you for a chance! Love this book and your fabric in the flower pattern is fantastic!! This would b fun to try on a larger scale and make a blanket. oh these are darling! i make some simple ones at work but would love to learn other techniques! That's really nifty stuff-- I'd never have even thought of doing stuff like that! What a great give away! I am so excited to have found this blog. My project list for 2013 includes making my own fabric flowers accent the totes I plan to make. I would love to use you book for inspiration. Creativity is not a skill I have to any great degree, yet. Another fun giveaway! I need to spend more time doing frivilous crafts. They make me happy. Oh how I wish I would win. Wow, thanks for a great giveaway! Love your blog! Love the little orange button :) These would be fun! Great flowers!! what a clever idea! so spring-y!!! This book looks so cute. I've not tried making fabric flowers before, but now I want to try! Thanks for the chance to win - I would love this book. I really like your flower - there are so many uses for them! Thank you for the opportunity to win! fingers are crossed. Thank you so much for the opportunity! I'd love to win! I love fabric flowers!!! Thanks! I made a purse for one of my granddaughters and put a flower on it. It turned out great. Thanks for the chance to win. I'm a fabric flower fanatic! Love to add flowers to bags. thanks for the giveaway. I would love to learn how to make these flowers! Yay! Another reason to hoard all those fabric scraps! With four daughters, that book would surely get some good use! Thanks for the chance! I would love to win this book and supplies! I would stay in my sewing room for hours playing with it!!! i would love to win this it looks like a wonderful craft to do. thanks for the chance!!! I can see myself putting these flowers on bags, dresses, and who knows what else! They are so cute! The more I see of this book, the more I'd love to have it. Your Color Me Retro flower is so very pretty - a great partnership with the book. I love your flower, it would be perfect on not only bags, but also on jewelry and quilts. Thanks for a chance at the giveaway. It looks like a great book, and I love your flower!! Love pink (and Hello Kitty). Would love to win the book too. You're flower and color choices are so bright and spring-like! I'd really like to win this book. I'd like to make a fabric flower wreath for my front door. Wow, what a fun project! I would love to try the book and notions. I'd love to win. It looks like so much fun. I love all the projects you are making with the color me retro fabrics! I'm in love with your line! Thanks for the chance to win. I've never made fabric flowers before but I'd love to make some for my daughters! Would love to try the wrap and fuse piping. How interesting! Would love to give it a whirl! I'd love to add some new ideas to my baby hats!!! THanks for a great giveaway! I'd love to win this book - what gorgeous flowers! I've made rolled fabric flowers before but not this kind. They are really cute! I'd love to win. I just stumbled upon your great blog.